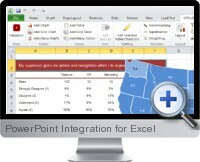 Excel PowerPoint Integration (Office Reports) is an integrated solution that provides Excel content and functionality directly within the PowerPoint environment. Excel data can already be linked to PowerPoint presentations but there are limitations with this approach as the data is static and users without the Excel file will have broken link messages. The integration bypasses these limitations by acting as a gateway between the two applications to essentially allow data to be manipulated within PowerPoint using Excel functionality as well as formatting and objects inherited into the presentation from Excel. Link in native and dynamic Excel content including data font styles, colors and conditional formatting into PowerPoint shapes, tables and charts. Use the integrated solution to create a new presentation or update data in an existing presentation with static data. Ability to edit the charts and tabular data in PowerPoint without the underlying Excel file making it ideal when emailing or sharing presentations. Replace specific texts in PowerPoint with text and styles or images as defined as global rules. Import the Excel formatting styles including conditional formatting when linking in data to PowerPoint. Advanced features include variable creation, table filtering and automation of reports for PowerPoint via VBA programming.